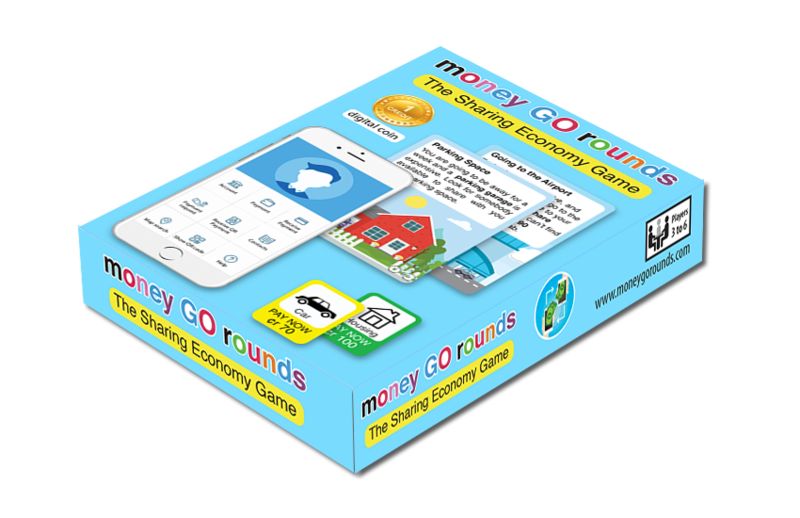 Money GO Rounds the card-game that let you simulate life in the sharing economy. Money GO Rounds enables the players to lend or borrow virtually anything, directly from each other. Items lent can be bycicles, appartments, parking spots, storage spaces, DVD's, books and tools. Each player has available a certain number of resources cards. Every time he lands on an available advertising space he can advertise a specific resource. Each card has a price tag and a QR code on the back. When some of the other players lands on that card, he will have to pay for the resource he is using. Payments are made using a smartphone with the Cyclos App. Once the player scans the QR code the payment goes through and the funds are taken from his account. The Cyclos App is used for making payments and for calculating of each player balance. - On a player's turn, the player must roll the dice and move his/her token forward the number of spaces as rolled on the dice. - If the player lands on an available advertising space, he will put on that space the resource card corresponding to the category advertised. The categories are the following: Transportation, Spaces, Services, and Stuff. - If the player lands on a space with an Ad of a player, he or she pays rent to that person, as specified on the resource card. - If the player lands on his or her own Ad space, nothing happens. - If the player lands on a Situation space, the player takes a card from the top of the respective pack and performs the instruction given on the card. - If the player lands on the Auction space, he or she will get a resource from the central pull, and run a silent auction for it. - If the player lands on Taxi, Mall or Hotel space he will have to pay the specified amount of money to the system. - If the player lands on a P2P Lending space, he or she may land up to $100 from other players if he needs them. Basically, players may loan money to other players. The game will present to the player several situations in which if there are no other players offering goods or services, he will have to buy them from the system spending much more money. The objective of the game is to survive as long as possible with an income coming from sharing resources with each other.